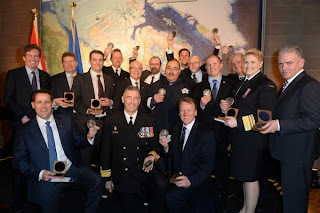 The Royal Canadian Geographical Society awarded Squamish-based One Ocean Expeditions, a commemorative medal for their tremendous involvement in the successful Victoria Strait Expedition. The HMS Erebus medal, named after the HMS Erebus, one of Sir John Franklin's vessels found during the summer 2014 expedition was specially created to commemorate the event. The one-of-a-kind medal was awarded to key leaders that contributed to the success of the remarkable undertaking and most important archaeological discovery in Canadian history. Prime Minister Stephen Harper and his wife Laureen Harper were in attendance and addressed the audience and award recipients with genuine authenticity and passion reinforcing the importance of Canadian lead initiatives and the role it plays for Arctic sovereignty being a part of our history and future. "Laureen and I are deeply honoured to be among the recipients of the HMS Erebus Medal, which recognizes our commitment to discovering one of our country's greatest maritime mysteries. This discovery would not have been possible without the incredible efforts of the 2014 Victoria Strait Expedition made up of government, private and non-profit partners. I had the privilege to take part in the search last summer during my annual northern tour and was impressed by the professionalism and dedication of the searchers plumbing Canada's frigid northern waters," said Canadian Prime Minister Stephen Harper. Andrew Prossin, Managing Director of One Ocean Expeditions was awarded the prestigious medal alongside with leaders from Parks Canada, the Royal Canadian Navy, Canadian Coast Guard, Arctic Research Foundation, The W. Garfield Weston Foundation and Shell Canada. Others that worked behind the scenes were also recognized including Inuit oral historian Louie Kamookak and One Ocean Expeditions Senior Management and staff. "Finding the Erebus was a great moment for Canada and Canadians. The Victoria Strait Expedition showcases the tremendous spirit of partnership and Canadian innovation invested in the epic search. It completes an important chapter in our history and solves one of the biggest mysteries in any polar region. We at One Ocean Expeditions are very proud to have shared our knowledge and expertise and are honoured to have taken part in an event that is now redefining our history," said Andrew Prossin, Managing Director at One Ocean Expeditions. About The HMS Erebus Medal – It was designed by a renowned Canadian medal designer, Susan Taylor. It features a stylized HMS Erebus superimposed on a nautical compass, and on the reverse, the Compass Rose of The Royal Canadian Geographical Society, with the Society name and Expedition name in both official languages, along with the inscription: "For contributions to the discovery of HMS Erebus". Small crowns symbolize the Society's Royal patronage, and the fact that Erebus is a Royal Navy ship. The medal is cast in bronze, a reference to the Erebus bell.